Sometimes you end up with a burger in an “odd” place. 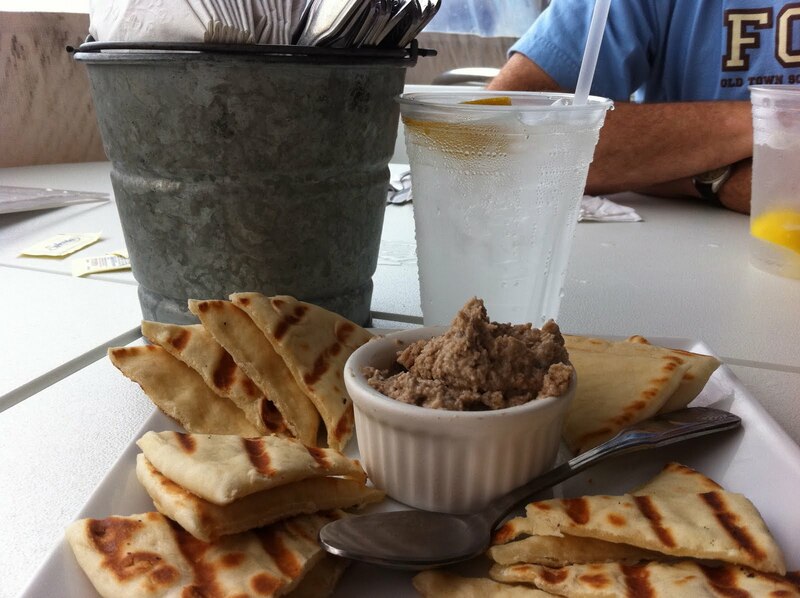 We went to the Great Southern Cafe in Seaside, FL, for lunch. You may, or may not, be familiar with Seaside. It is a highly planned community between Panama City and Destin on 30A. It was also the backdrop for the movie the Truman Show. It has lots of shops and restaurants and a, relatively new, Airstream dining area, with several restaurants housed in vintage trailers. With another rainy day at the beach, we were heading toward the outlets in Destin and needed to eat. I was drawn to the Great Southern by their buy/cook local signage and the fact that the line wasn’t ridiculous. We looked over the menu and I was heading strongly towards shrimp and grits, but they couldn’t be made without the despised portobello mushroom, so I fell back on the cheeseburger. We started with a black-eyed pea hummus appetizer. We eat hummus on occasion, and this one had a decidedly southern spin. The pita chips served with it were semi-soft and hot. They were awesome. The hummus was different. Not bad, not great – just different. We did, however, eat all of the pita bites. As I said, I went with the bacon cheeseburger. The fries were beer battered and double fried (as were Jo’s hush-puppies) which she said were awesome. 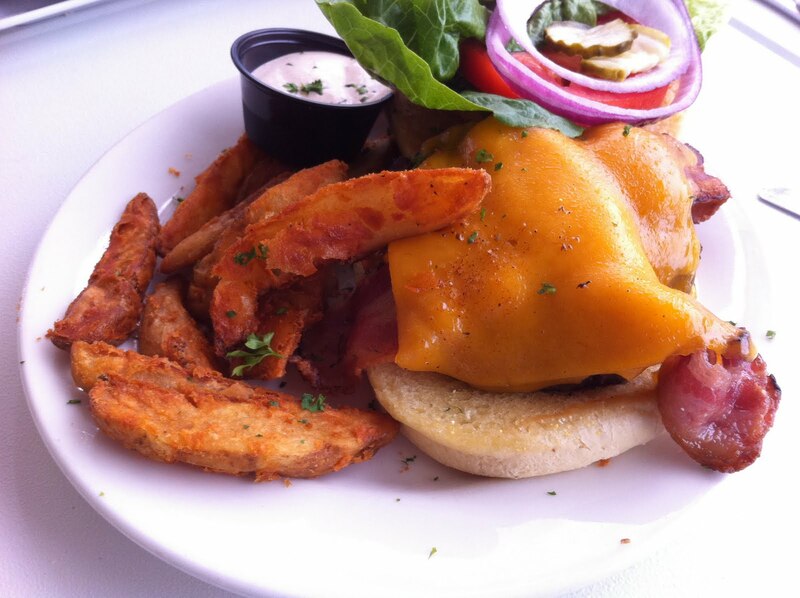 This was a good burger, with great bacon. Note, I use the word “great”. There are three categories of bacon in my lexicon: good, great and excellent. This was on the high end of great. To give a reference point for excellent bacon – the deep-fried bacon goodness at Ann’s Snack Bar comes to mind. Jo had fish that, even though we could see the ocean (dimly through the rain) didn’t appear to be fresh and definitely wasn’t cooked throughout. I was about to write this place off as “okay, but no real reason to return”, until the waiter asked about dessert. We had both noted no less than four references to their homemade key lime pie, so we ordered a slice. I started to say that I like key lime pie, but that would not do my feelings justice. I Love key lime pie with a capital “L”. 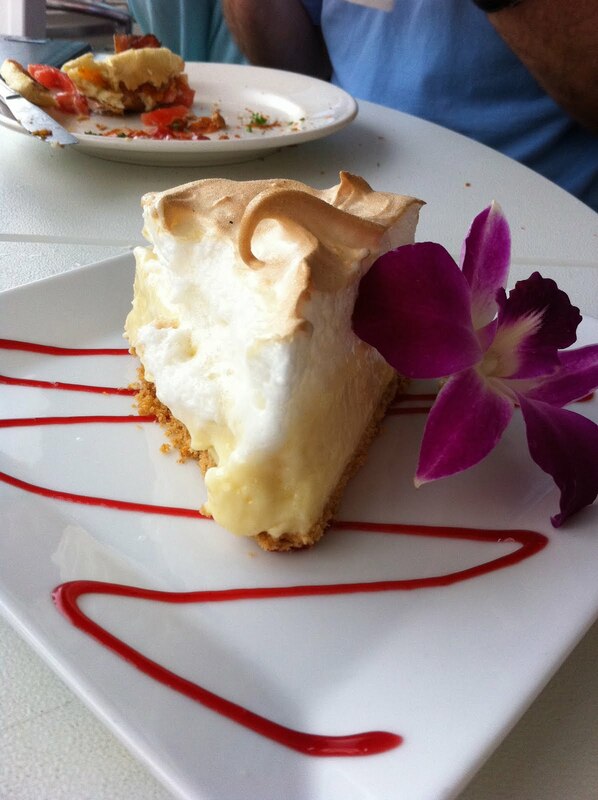 Key lime pie can be really good or mediocre. Kind of the base line for acceptable key lime pie in my mind is Mrs. Edwards frozen key lime pie singles. For some odd reason, they are nowhere near as good as a well made pie, but an amazingly good copy for $2.00 something a slice.